All attention was on the pack of wild dogs next to the road as they tore flesh from the fresh carcass of a male impala. Bones were crunched and guts were slurped. Ribs exposed. The stomach was ripped open and grass, not yet digested, steamed as it met the air. Raw, guttural Africa. The painted dogs didn’t notice the hyena – nobody did – until it was right between them, a desperate look in its eye, thrusting its mouth into the dead prey. The mottled dogs whined and yelped and jaws snapped – as if frightened, not fierce. Yet they drove the intruder back. It slunk away, lurking under a bush on the other side of the road. The wild dogs returned to their kill and continued crunching bones and slurping innards. Ignoring the collection of vehicles around them. Minutes later, the hyena was back. This time there was an explosion of yelps and ribs and carcass and dust; tearing flesh as legs and tails flailed. Two on one. Dead body torn. Three on one. Desperation. Hyena and impala lost in a swirl of dust. High-pitched cries and yelps and whines. And then it was still; once more, the hyena had been driven away; empty mouth, empty stomach. The dogs had been released as a pack of five in Hluhluwe-Imfolozi Park two days earlier. They’d spent six weeks in a boma after being transported from South Africa’s Limpopo Province and it is hoped that these endangered animals (there are fewer than 5 000 in Africa and less than 500 in South Africa) will settle and establish a population in the park. The only viable wild dog population in South Africa is in Kruger, where between 150 and 250 animals have been identified. Conservationists are working on establishing a second population in northern KwaZulu-Natal. The dogs were set free in what was once Hluhluwe Game Reserve, a beautiful hilly area known for its deciduous forests and tall grasslands. Over two days, they’d covered around 50 kilometres and the two males had split from the females. The dogs’ journey from the northern section of the park to the scene of the drama that sticky evening in mid-January would have taken them over undulating hills, giving them spectacular views across their new territory. After crossing the Hluhluwe River into the southern section of the park, they’d reached what was the old Umfolozi reserve, once the hunting ground of the legendary Zulu king, Shaka. Today this section of Hluhluwe-Imfolozi is 30 000 hectares of pristine wilderness – land accessed only on foot, by canoe or on horseback. Humans are not permitted – in any way – to affect the environment and, for just a few months a year, people can walk the paths carved by rhinos, elephants and antelopes. This park in KwaZulu-Natal is famous for bringing the white rhino population back from the very brink of extinction. In Operation Rhino, the colossal, square-lipped creatures were darted and transported to various locations around South Africa and it is now one of conservation’s greatest success stories. The day after the impala kill, the dogs walked north, back towards the place where they’d been released. They arrived in the early afternoon, looking agitated, and paced up and down, ears alert, painted bodies creating a haze of white and mottled browns. After crossing the Black Mfolozi River, they must have meandered past Umganu view site and Umbondwe picnic site, areas well known for grazing white rhinos, and then dropped down to the Nyalazi River, a favourite hang-out for elephants. They would have passed through what was once known as The Corridor, the land between the old Hluhluwe and Umfolozi reserves, which was incorporated into Hluhluwe-Imfolozi Park in 1989. Their journey would have taken them over the green hills towards the thatched flagship of Ezemvelo KZN Wildlife’s accommodation, Hilltop Camp. 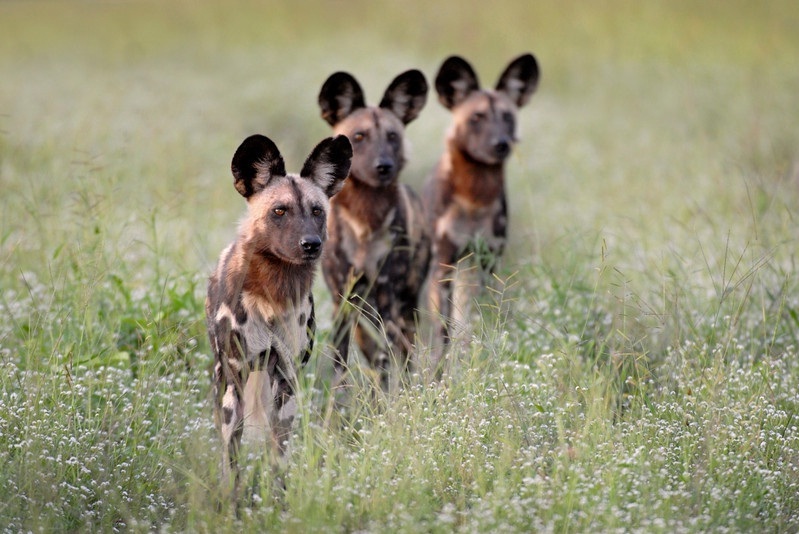 Wild dog packs occupy large territories – often up to 1 500 square kilometres – so it was no surprise that the following evening, the third night after they’d taken down the impala, the dogs were back near the kill site in the southern section of the park. They were heading towards Mpila Camp, the main base in the southern section which overlooks the pristine wilderness area. The dogs were in prime white rhino territory, open savanna and grassland. Elephants roam there too, leaving uprooted trees dying, trunks stripped of their bark. This is serious Big Five country and, during winter, when the bush is sparse and water in short supply, game viewing is at its peak. After a couple of days here, you’ll find yourself tuning in to the way of the wild. You climb out of bed before sunrise to see what you can find along the Sontuli Loop in the south. At Thiyeni Hide, you watch hammerkops mating. You take an early morning game walk and see a white rhino from a distance, get rather close to wildebeests and zebras, and spend hours in pure natural bliss. You get to recognise the smell of middens and see so many rhinos around Umganu you no longer stop to watch them. Instead, you spend five minutes watching a sandgrouse and her tiny chick scuttle across the road. You witness the intimate relationships between female wildebeests, impalas and zebras and their young, and hope none of the little ones you’ve watched will fall prey to predators. You hear lions roaring at night, but search in vain for them by day. One afternoon, you wake from your siesta to see an elephant bull less than a metre from your bedroom, picking marula berries from the ground. You take photos of his toe nails. By the third evening, the two male dogs had regrouped with the females. There’d been a scuffle, or perhaps a fight for life with another large predator: one had a torn ear and another limped badly. As the last of the day’s light brushed the painted bodies, you knew they’d live many more twilights of tension. That’s just the way of the wild – and sometimes you’re privileged enough to witness it. If you ever get the chance to visit the small South African town of Nieu Bethesda, go. Go for as long as you can….